The RT655 provides cost effective, efficient road sweeping. 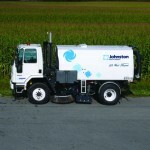 Regenerative air recirculation, in conjunction with large forward facing 'digger' gutter brooms and a full width suction hood maximizes sweeping speed. Combined with ergonomic operator controls and low running costs, the RT655 provides an ideal solution to a variety of sweeping applications. The operator environment is more important today as drivers work maximum hours and multiple shifts. The RT has been designed to fit onto a wide variety of chassis while giving the best maneuverability in its class. This allows for each user to select a chassis which suits their needs with the knowledge that the Johnston sweeper will provide the power and performance required to achieve the task.